Sixteen Rockland High School student council members rode the wave of leadership all the way to the Massachusetts Association of Student Councils (MASC) conference in Hyannis from March 11-13, and are making waves as they return. About 1,200 students from all over the state came together to collaborate on new workshops, community service ideas and ways to improve their towns’ community and their high schools’ atmosphere. All ages of high school students attended this conference from the fourteen-year-old freshmen, all the way up to the eighteen-year-old seniors like myself. Every conference plays a different role for each individual, but in my four years in this organization, this year has been the most fulfilling and successful. At MASC the 2nd Annual Polar Plunge took place and, like last year, the fundraising goal was set at $10,000. MASC participants reached the goal once again, and this year they nearly doubled their donations, raising over $18,000 for the Special Olympics of Massachusetts (SOMA). Rockland contributed a large amount to the cause, coming in second for raising the most money across the state. We are so proud of our own student council member, Caitlin Yannizzi, for being the top fundraiser in the entire state. Several of Rockland’s members ran workshops. Sophomore Shawn Ward ran his first workshop ever with junior Ashley Pezzella, SEMASC President Elect, and received tons of positive feedback. Ward said that running this workshop left him with a rewarding feeling. Personally, I have seen Shawn grow tremendously this year, and the feedback from his workshop only embodies how he has matured as a leader. You are probably wondering what crazy chaperones would be brave enough to take the trip down to Hyannis with 1,200 energetic teenagers. Well, we have some advisors to thank: returning veteran Kristen Walsh and our rookie advisor, Joanne White. Ms. White had a successful first year to say the least. She was in charge of our lip- sync routine for the competition. Under her direction, this was not your ordinary lip-sync. There were props, a choreographed routine and a selective mixtape to tell a story of boys vs. girls with the girls coming out on top in the end. With all the practice and hard work, Rockland went from last place in the previous years to first place this year. One of the main events of the conference is the recognition of all the hard work that takes place during the year by student councils. Rockland’s hard work was documented by junior Haley Macray, sophomore Adam Royle and senior Nicole Cook who put together an Excellence Book, a two-inch binder containing indicators and documented quotas that show all that our student council has done, including fundraisers and community service projects. To receive a Gold Council of Excellence Award, a school must attain a total of at least 46 out of 50 points. The hours of hard work paid off when Rockland received this award for the fifth year in a row. Rockland also received one of the Top Ten Project Awards for their “Puzzles for Alzheimer’s Drive.” Coordinated by Macray with the “Puzzles to Remember” organization, the drive resulted in the collection of over fifty puzzles from students. They were then donated to local facilities that treat Alzheimer’s patients. 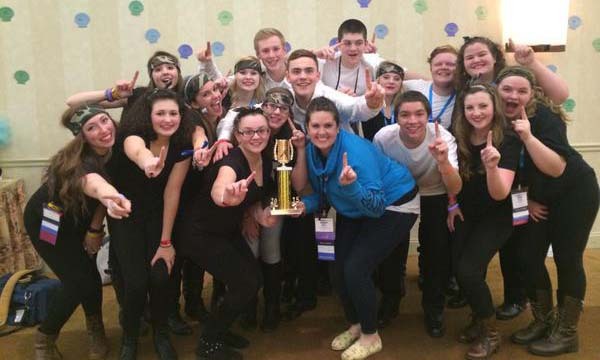 Rockland swept the board at MASC this year with a first place lip-sync trophy, a Gold Council of Excellence Award, recognition as a top fundraiser in the state and a Top Ten Project Award. Although it is an honor to see all of these awards show off the dedication and excellence of this council, seeing each and every one of these leaders taking the next step outside of their comfort zones and striving for something bigger than before is what makes all that we do worth it. I am so proud of all that this council has accomplished and it has been an honor serving as the president, watching everyone grow every step along the way.